#TwitterPurge - a Much Needed Shake up for Influencer Marketing? 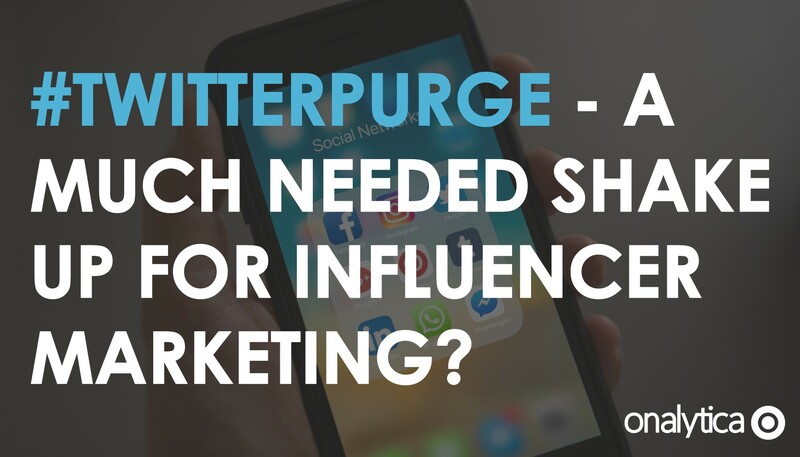 #TwitterPurge – a Much Needed Shake up for Influencer Marketing? Not only have Twitter made it more difficult for automated bot-like accounts to be created in the first place by introducing email and phone account verification, but they’ve run a thorough audit of all existing accounts on the platform. They’ve done this by ‘locking’ accounts that demonstrated bot-like and automated activity, which if not reactivated by the account creator, have been suspended. Throughout May and June, Twitter suspended over 70 million accounts – that equates to over 1 million accounts per day. Think a million a day sounds like a lot? Well, you may or may not have noticed that upon waking up on the morning of Friday 13th (ironic? ), Twitter conducted one massive cull over night – being referred to online as the #TwitterPurge. Some accounts that have bought their way into the high follower count region, went to sleep with 1 million followers, and woke up with 250k. It’s been huge. As an influencer marketing software company whose social media remit covers Twitter, we at Onalytica can’t see this in any way other than positive. Here are some of our thoughts, with a sample of some of the affected high-profile accounts outside of mainstream celebrities, along with some analysis based on our own influencer database. Why were there so many fake accounts in the first place? Because we’re obsessed with numbers; we’re obsessed with follower counts and engagements in the form of likes, retweets and favourites. And for what? Because in influencer marketing, this is (to some) what’s deemed to be ‘influential’. Now, demand drives supply, and in us (and by us, I mean the influencer marketing industry) demanding that ‘influencers’ have huge numbers behind their social media accounts, we’ve created the supply. We’ve somehow concluded that high reach = high influence. But we have to ask ourselves – why do we care about these numbers? Brands work with influencers because they want results and action. Fake accounts are not going to drive either of those things. 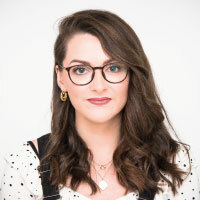 Now there is an element of ‘if you can’t beat them join them’, whereby influencers are being unfairly bench-marked against other influencers whose follower and engagement stats just simply can’t be competed with, forcing them to do the same thing to keep their head far enough above the water to get noticed. We talk about the topic of whose fault this is and what more needs to be done in the industry in our article here. We’ve seen lots of name-and-shaming of celebrity accounts such as Katy Perry and Justin Bieber, who have lost in the region of 2-3 million followers in the cull. However, Katy Perry and Justin Bieber are two of the most followed social media accounts on the internet. Commenting on them losing a few million followers is like expecting a millionaire to care about losing a few coins out of their wallet. In the grand scheme of things, it’s really insignificant. Sure, Katy Perry losing 3 million followers sounds like a lot, but it’s a mere 2.7% of her overall followers. Most high profile accounts have lost anywhere in the region of 0.5-3% of their followers – this is no reflection on the account. There are however, accounts that have lost far fewer than 3 million followers, but a much higher percentage of their total follower count. These are the ones that we should pay attention to, as they’re the ones that are far more likely to have bought their followers. To add to and reiterate the above point, just because someone had and has lost lots of ‘fake’ followers, this doesn’t mean that they’ve necessarily bought the fake followers themselves. Let’s be rational for a second here – Katy Perry would have no need or desire to buy herself followers. For one thing, she isn’t short of followers, nor will it make that much of an impact to her personal brand to have a few more. To return to my millionaire analogy, it’s like accusing them of stealing a few coins – where’s the motive? So we come to the question of why she even has these accounts following her in the first place. In order for fake accounts to look as real as possible, it’s important that they to some extent mimic real behaviours. Real accounts of ordinary, everyday people will often follow their favourite pop stars, TV stars and politicians. So, a bot account following a celebrity would in theory make the account appear more real and less suspicious. Even Twitter’s own Twitter account has lost a significant amount of followers – they’ve lost over 12% of their total followers in the purge. Is this the shake up that the influencer marketing industry needed? In short, yes. If you’ve been reading our blogs for a while you’ll know that we’re passionate about educating the industry to move the laser focus away from how many followers an influencer has, and instead analyse how relevant an influencer actually is, how relevant their audience is, how engaged their audience are, how well regarded they are by their influencer peers and how influential they are offline, too. On an influencer level, the influencers that have evidently bought followers will have lost a tremendous amount of credibility over night. That’s not to say that all influencers that have bought followers should be totally discredited as they may be genuine experts in their fields taking short cuts to build an online presence, but it will certainly be a slap on the wrist for them. The influencers that have restrained from buying followers and instead opted to play the long game of organically growing and sustaining their audience, will now stand more of a chance; the fact that their followers haven’t seen a massive drop will show that they’re real, ethical, have an authentic audience and can therefore be trusted by brands. However, the problem is far bigger than influencers buying followers. The spectrum of dishonesty and ‘fakery’ in the influencer marketing industry is vast. Influencers are buying engagements, engaging in reciprocal arrangements and using automated systems to follow and engage with other accounts to get ‘real’ follows and engagements back. To read more on what more needs to happen in the industry, read our blog here. How much of Twitter has been affected? We’ve conducted an audit of our own influencer database of 500k social media influencers to gauge just how widespread this cull has been. Out of our whole database, 25% saw no decline in their followers whatsoever from the #TwitterPurge, meaning that 75% did see their followers decrease by 1 or more followers. Now 75% sounds like a lot, but 93% of those affected saw a drop by 3% or less. What we were also interested in exploring, was which sectors were most affected out of the following: Health, Tech, Marketing, Finance, Education, Arts & Culture, Sport, Politics, Journalism, Legal, Fashion and Travel. The results were similar to what we’d expect. Which industry has been most affected? Which sectors have been affected the most? 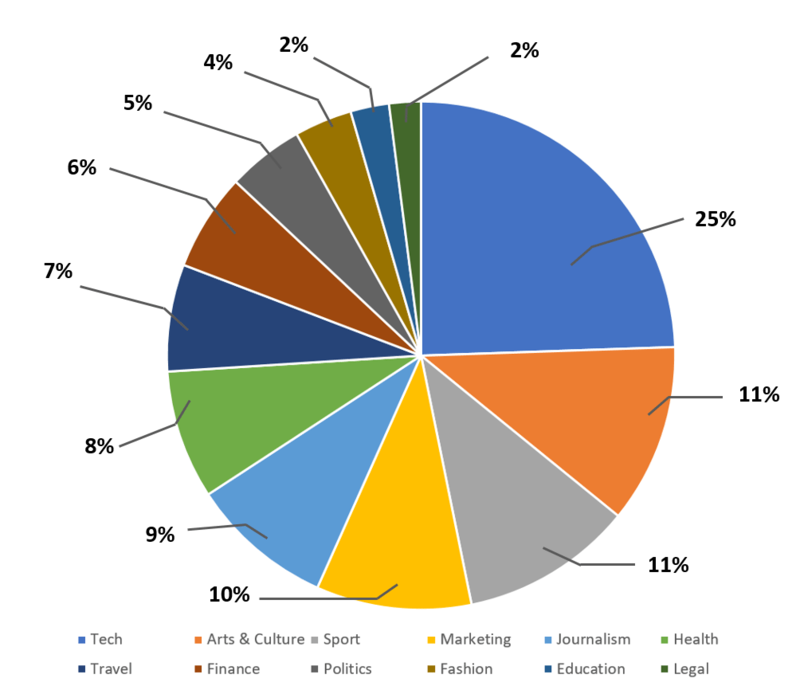 As you can see in the above pie chart, the most affected industry has been the tech industry, with 25% of the affected influencers working in tech. On the other end of the spectrum we have the legal industry being the least affected, with only 2% of affected influencers working in the legal industry – perhaps due to ethical repercussions. Finance, an industry that is heavily regulated is also unsurprisingly very low at 6%. Fashion, a very Instagram-centric industry, also comes in very low as expected at 4%. That being said, Travel, which is also an Instagram-centric industry came in middle of the pile. This does serve the question of the scale of this issue on Instagram. Something else we were interested in seeing, is the correlation between % of followers lost and average posting frequency. The difference in posting volume for accounts losing less than 3% and all other percentages is huge, and actually, different to what we expected. Now, what we expected to see before pulling this data, was to see evidence of ‘spammy’ activity in the accounts that have bought the majority of their followers. However, bar the less than 3% category which is the lowest posting quantity (as expected), average posting quantity actually goes down with the higher % of followers lost. What this indicates, is that the groups with less followers lost (e.g. 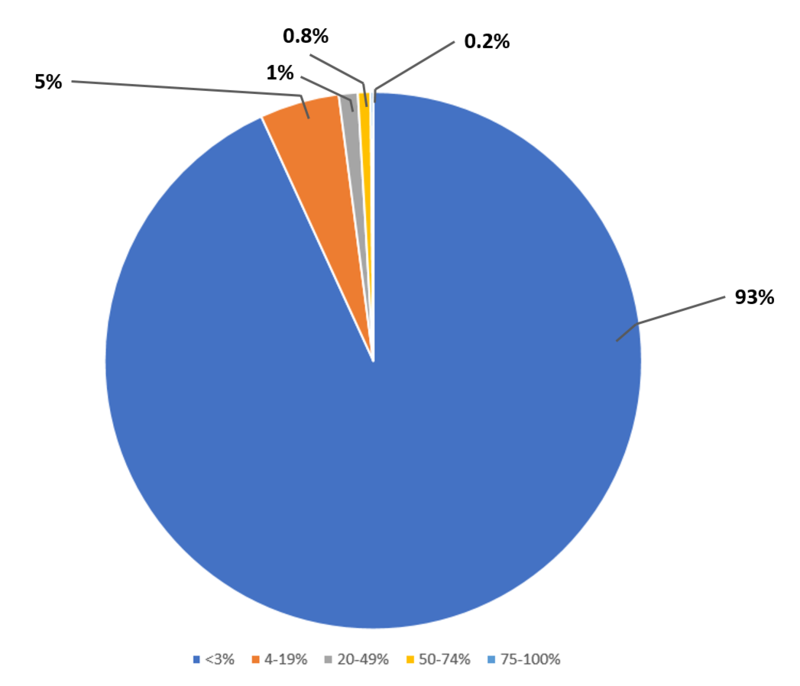 4-19%) , are perhaps using other means, such as high quantity of tweeting and retweeting, in addition to maybe purchasing some followers, to up their overall follower count. Whereas the accounts that have bought a large quantity of followers (e.g. 75-100%), haven’t used high volume tweeting to gain any more. Who has been most affected? Now here is the fun bit. Here are some examples of the vast array of accounts that would have looked credible and influential, with impressive metrics to most if you looked at their account pre-cull. What’s important to note here, is that given the high % of followers that have been culled it’s highly probable, but not guaranteed, that these individuals paid for all the fake followers. However, it doesn’t necessarily take away from their talents or expertise, but it does serve the question of whether they’d have been given the opportunities they’ve been given had their follower numbers been smaller. For example, let’s take Cory Machado – he’s a wrestler, so is no doubt talented; he does work for charity which is great, but would that charity have approached him to work with them if his audience were smaller? Equally, number 2, Ashutosh Garag – he may be an expert in his field, but would he have had 5 best-selling books if his audience were smaller? What we’ve found particularly amusing with this list, is that the Saatchi Gallery have in their bio: “Saatchi Gallery is the world’s No. 1 followed museum on social media”. Now we don’t want to speculate too much here, but with a 19% drop in their follower numbers, they’re no longer No. 1 followed museum on social media. At Onalytica, we down-weight influencers that appear to be buying followers or automating any channel activity to misrepresent reach metrics in their overall influence score. Instead, our methodology prioritises metrics such as topical authority and engagement. For a free trial of our influencer discovery software and to discover quality influencers and insights, click the button below.